Fourteen years ago the American Geological Institute (AGI) sponsored a Short Course on Chain Silicates. At that time, a substantial amount was known about the crystal chemistry and phase equilibria of pyroxenes, and this knowledge has been of fundamental importance in guiding research on pyroxenes in the years following the AGI Short Course. In 1966, single-crystal x-ray diffractometry was well advanced and good crystal structure refinements were available for jadeite, spodumene, hypersthene, c1inoferrosi1ite, orthoferrosi1ite, and omphacite; the distinction between the c1inoenstatite (pigeonite) and diopside (augite) structures had been established, and the structure of protoenstatite was known, although some doubt existed about the space group of protoenstatite. Phase diagrams for several joins in the pyroxene quadrilateral had been published, but often equilibrium had not been established in the experiments and not enough was known about the effects of pressure, oxygen fugacity, and non-quad elements such as aluminum on the phase equilibria. Also, inversion relations of Ca-poor pyroxenes were not well understood, and petrologists had just become aware of the effect of stress on orthoto-clinopyroxene transitions. In 1966 few of us would have guessed how-much new data and new analytical results would become available in the next fourteen years. Although most, if not all, of the important instrumental techniques we use today were available in 1966, the truly spectacular development and application of these techniques did not take place until the Apollo 11 samples and the attendant funding from NASA became available. Pyroxene research has profited immensely from the application of Mossbauer, optical, and infrared spectroscopy, x-ray and electron diffraction, transmission electron microscopy, automated electron microprobes, and digital computers. During these years experimentalists extended the capabilities of their equipment to examine the behavior of pyroxenes under conditions of controlled oxygen fugacity, pressure, and temperature, conditions more nearly like those under which pyroxenes crystallize in natural systems. Looking back, one remembers the excitement of seeing the first lunar samples. We were surprised at the large amounts of pigeonite and the quality of crystals unaffected by water or the presence of sodium. The influence of the lunar program on pyroxene research was extraordinary, and our understanding of pyroxene relationships in terrestrial occurrences benefited tremendously because the lunar pyroxenes provided a basis for comparison with the more complex chemical and structural behavior of terrestrial environments. Probably the most impressive development in the early lunar sample studies was the application of transmission electron microscopy to mineralogy. We were able to see exsolution and other textural features in crystals that looked homogeneous in the optical microscope, thus opening up a wide range of research possibilities that had not existed previously. Advanced crystal growth experiments, detailed phase equilibria, x-ray diffraction at high temperatures, and statistical analyses of microprobe data were all applied to lunar pyroxenes and then extended to terrestrial and meteorite investigations, making this period one of the most productive in history. In the compilation of this volume, an attempt has been made to review the essential aspects of pyroxene research, primarily those of the last ten or fifteen years. Although the largest fraction of pyroxene research has been performed in the U.S.A., significant advances have been made in other countries, particularly in Europe, Japan, Canada, and Australia, with interest and activity in these countries probably growing at a faster rate than in the United States. Recently, Deer, Howie and Zussman (DHZ) published a second edition of their volume in the Rock-Forming Minerals series, Single-Chain Silicates, Vol. 2A (John Wiley, New York, 1978). The present volume is intended to be complementary to DHZ and to provide material covered lightly or not at all in DHZ, such as electron microscopy, spectroscopy, and detailed thermodynamic treatments. However, because the range of pyroxene research has grown so much in recent years, there still are important areas not covered comprehensively in either of these volumes. Some of these areas are kinetics, diffusion, crystal defects, deformation, and nonsilicate pyroxene crystal chemistry. Because of these omissions and because this volume is intended for use with the MSA Short Course on Pyroxenes to be held at Emory University in conjunction with the November, 1980 meeting of the Society, a Symposium on Pyroxenes was organized by J. Stephen Huebner for the meeting that is designed to present the latest research results on several different topics, including those above. With DHZ, this volume, and publications from the Symposium, the student of pyroxenes should be well-equipped to advance our knowledge of pyroxenes in the decades ahead. In 1980 the Council of the Mineralogical Society of America agreed to change the title of the serial publications proceeding from these short courses: Short Course Notes were renamed Reviews in Mineralogy in order to more accurately reflect the content of these volumes. This volume, Pyroxenes, and Volume 5, Orthosilicates, were the first to appear under this heading. 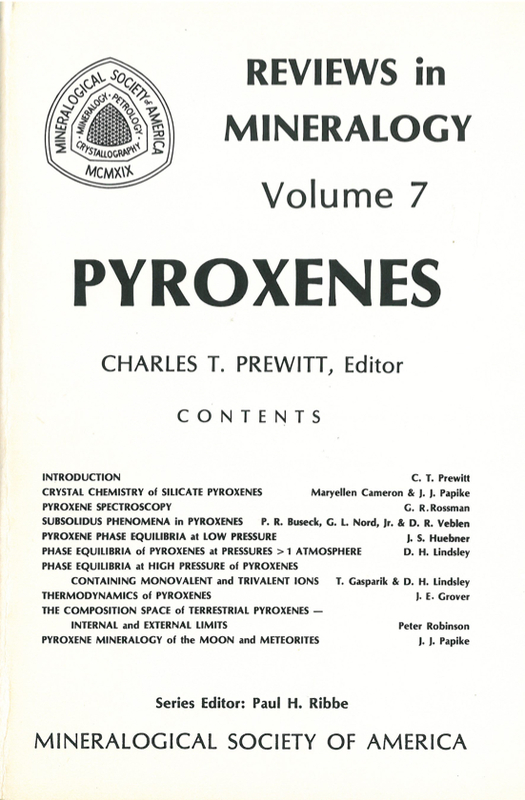 The second printing of Pyroxenes was undertaken after the first printing of 2000 copies sold out within fifteen months. Only minor corrections have been made to the text, and many of them pertain to the up-dating of references that were in preparation or in press at the time of publication.